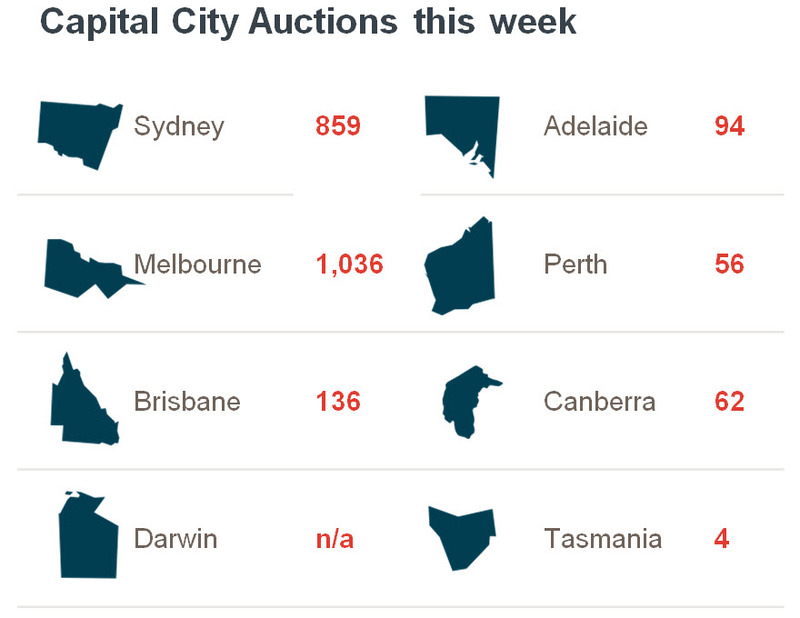 This week, the number of auctions scheduled to take place across the combined capital cities is expected to rise, after last week saw a slowdown in activity due to the public holiday held in most states, including the two largest auction markets. There are 2,247 properties scheduled to go to auction this week, increasing from the 1,279 auctions held last week and also higher than results from one year ago (2,183). Across Melbourne and Sydney, the two major markets, auction activity will increase considerably, with Melbourne host to 1,036 auctions this week, up from 389 last week, and Sydney with 859 homes scheduled to go to auction, increasing from 619 last week. It is expected that the remaining capital cities will see an increase in volumes this week with the exception of Tasmania, where activity will remain relatively steady over the week. Glen Waverley in Victoria is the busiest suburb for auctions across the nation this week, with 20 homes set to go to go under the hammer, followed by Mosman in NSW with 16 scheduled auctions, and Reservoir and St Albans both in Victoria, with 15 auctions each. Last week saw the final auction clearance rate across the combined capital cities fall to 67.8 per cent, recording the lowest clearance rate year-to-date, across a significantly lower volume of auctions week-on-week. The decrease in activity last week was attributed to most states being host to the Queen’s birthday public holiday, with 1,279 auctions held last week, down from 2,578 auctions the week prior, however higher than the corresponding week last year (1,100). In Melbourne, final results saw the clearance rate increase last week, with 75.9 per cent of the 389 auctions clearing, up from the 73.1 per cent across a higher 1,188 auctions over the week prior. Across Sydney, the final clearance rate dropped below 70 per cent for the first time since April 2016, with 67.7 per cent of the 619 auctions successful last week, down from 71.9 per cent across 1,019 auctions the week prior. Across the remaining capital cities, clearance rates improved in Adelaide and Brisbane, while falling in Canberra, Perth and Tasmania, however auction volumes were significantly lower last week compared to the week prior. Geelong recorded the highest clearance rate of all the non-capital city regions, with 77.3 per cent of auctions reporting as successful, while the Gold Coast region had the highest volume of auctions (49). ← Ever Heard of a Nano Home?